Teaching social and emotional regulation skills through picture books is a wonderful way open a discussion and illustrate important topics with kids. It is much less threatening for a child to address concerns from the viewpoint of a fictional character, especially a non-human one … let’s say like a FISH! Marcus Pfister does an excellent job of tackling some important issues through the Rainbow Fish series. In the first book, The Rainbow Fish, Rainbow Fish learns the importance of sharing and how being kind to others feels so much better than being better then others. During the second book, Rainbow Fish to the Rescue, Rainbow fish learns about being kind to a newcomer and standing up for what’s right … even if it means risking losing your friends. 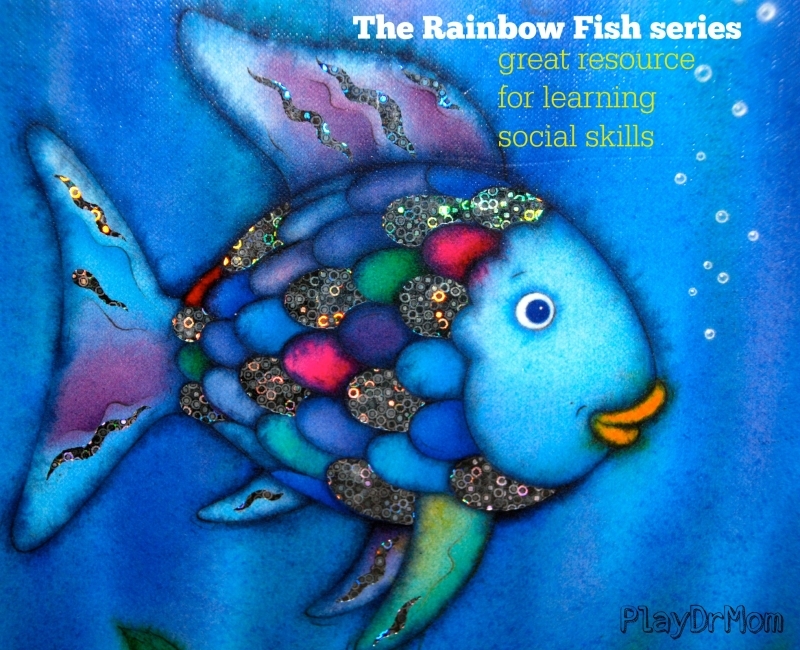 Rainbow Fish uses some problem solving strategies and asks others for help when he gets lost in Rainbow Fish Finds His Way. Rainbow Fish and the Big Blue Whale find out what happens when a misunderstanding isn’t resolved. And Rainbow Fish learns about the importance of being open to new experiences and friends in Rainbow Fish Discovers the Deep Sea. And when Little Rainbow Fish has trouble falling asleep, Mommy helps him out in Good Night, Little Rainbow Fish.